Unravel is heartbreaking. But it's not a depressing kind of emotion that lies at the core of this charming and pure little puzzle-platformer. Rather, as an introverted little reflection on life and human relationships, Unravel is heartbreaking because it represents a warmer, more sentimental side of humanity. Related reading: Nintendo's also created an game with a yarn character as the lead. Read Brad's full review of Yoshi's Wooly World here. And that's a little ironic, because the hero of Unravel isn't human at all. Yarny, a little creature made purely from wool, is mute and yet bears such a strong personality that he is more than capable of pulling that game's threads together in a cohesive whole. Every movement and every action that Yarny takes shows subtlety, love, and care. There are games with thousands of lines of dialogue that fail to nail characterization as well as the development team has done with Yarny. And though the number of genuine threats in the world of Unravel are limited, every time I failed Yarny I felt terrible. He doesn’t like water, and if he spends too much time in there he drowns. It mortified me. I was responsible, and, importantly, I felt responsible. His pained reaction when a crab grabs him in its pincer perhaps even more so. Because the pacing of the game is slow and sedate, I knew I should have done better by Yarny. He deserved better than me. I haven’t felt so personally invested and responsible for a character in a platformer than when I fell in love with the white fox in Never Alone. It’s no small wonder EA decided to release a video on how we can all knit our own Yarny. What Yarny represents is so precious, too. Yarny is a visual representation of an old woman looking back on life; of hers and her family. As Yarny makes his way through the varied and unbelievably stunning worlds, he witnesses snapshots of memories - of home, of holidays, of life, growth, love and loss. These are so delicate - really nothing more than moments in the breeze, and yet they demand attention and reverence. These are what’s important in the world, and the way Yarny stares intently at each one, mute as he is, focuses us as well. Rarely have we seen a game so effective in telling its story by simply pulling the player’s attention in a direction without even making them aware of it - it’s truly masterful visual storytelling. The environments subtly reinforce these themes, and as Yarny moves through them, his body trails a strand of wool - his wool. He becomes more and more decrepit as continues, to the point where he is nothing but a hunched-over skeleton, with no wool to allow him to progress further. The only way forward then is to find a new ball of wool in the environment somewhere, which Yarny absorbs and is instantly revitalised, allowing us to experience more memories from the particular scene that we're exploring. It's a remarkably simple visual motif, but a genuinely powerful one, as it builds a link between memory and something typically associated with those approaching the end of life - yarn and traditional craft toys. Reinforcing this is Yarny's own sentimentality. 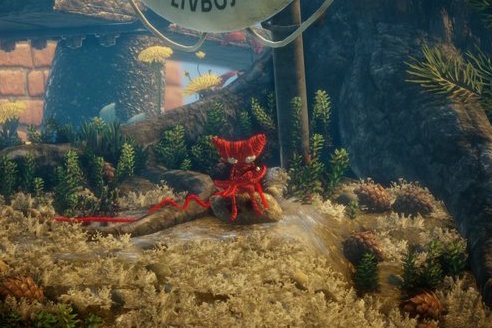 The reason he is exploring these environments is, ultimately, so Yarny can collect a wool stamps that he can place on to a book when he is back at the old woman's home, which acts as a hub to each of the game's levels. The way Yarny hugs these stamps with overwhelming sentimentality and nostalgia and as he acquires them is heart-melting, because through him you can sense just how precious the memories are to the old lady. 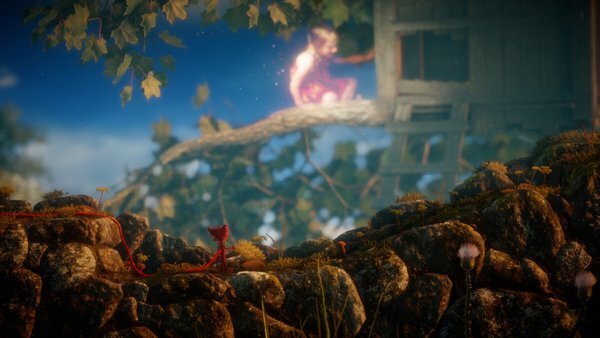 There's a melancholia about the whole experience, too, which from the outset makes it clear that Unravel is also a story of loneliness and the kind of reflection - tinged with both hope and regret - that can only happen at the end of life. Without being distressing, the vulnerability that permeates through every thread of the soundtrack sets a deep and resonate emotion; this is one game that would lose a great deal of its impact of it was played without its soundtrack. Yarny himself is as vulnerable as the woman who is reminiscing about life through him. A tiny creature with no physical abilities, Yarny is intimidated by seagulls and smaller creatures. The smallest pool of water is a deadly hazard. It’s not a frustrating game, because checkpoints are always just a few steps behind you, but rather, as I mentioned before, it’s affecting to even make one mistake, because Yarny's innocence and purity is one that you don't want to see suffer. No more than you want bad memories to cloud the positives when reflecting back on life. That fragility forms yet another layer of emotional depth in Unravel, because it is something that we can all relate to - memories are precious things that we don't want to lose, but are all-to-easy to let slip. Yet for that melancholia that runs through the entire adventure, Unravel is most certainly not sad. It is, ultimately, a celebration of the bonds that bring family together. That might sound paradoxical, but in effect it's really not - it's merely an acknowledgement hat human relationships and emotions are complex, nuanced things, and that brings me back to the irony that I mentioned at the start; this is one of the rare games that really does capture the full gamut of human emotion, and that's especially incredible considering there's not a human in sight. Perhaps that's the point; humans are flawed. Yarny can simply represent the good of humanity without feeling contrived. The small development team at the heart of this game have done such a good job with it. In a world where your hero is smaller than almost everything around him, the attention to detail was always going to be important, and Unravel gets the smallest of details down perfectly. The shape of the fruit off trees that is larger than life. The animation of the birds that are suddenly giants. The sense of scale within the most mundane of objects and environments lends everything that necessary sense of exploration and adventure. Related reading: And for a follow up tear-jerker, be sure to check out Valiant Hearts: The Great War. Matt's full review. Depending on who you are, you might find the puzzles themselves to be a bit disappointing, however. 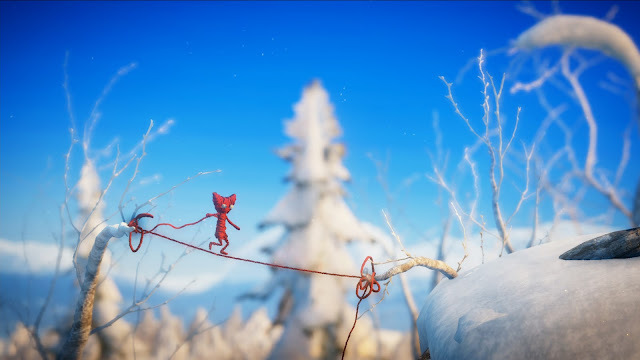 Unravel is a game that wants to be completed (because a major part of its message is found at the end anyway, and if it doesn’t have you in tears, nothing will). Because of that the developers have made the puzzles really quite straightforward and easily projected. There’s a nice logic to them, but as opposed to a game like, say, The Witness, which wanted to test players, in Unravel the puzzles exist more as an way of keeping players engaged in “game” elements without resorting to violence or action. That being said, it is the right genre for this kind of game, and I’m quite happy to see that Unravel focuses on its narrative. I just know that it’s going to disappoint some people who struggle to see the value in games that aren't gamey and "difficult". But as far as I’m concerned Unravel is truly something special, and full credit to both the developer, and indeed EA, for stepping back from the blockbuster nonsense to back a more personal, artful project. It’s a beautiful game about human emotions and memories, and while I hope there’s never a sequel, I cannot wait to see what this team comes up with next.